Japanese astronaut Koichi Wakata unlimbered the shuttle Discovery's robot arm today and geared up to mount a nine-ton truss on the hull of the international space station, kicking off a busy five days of complex assembly operations. "I'm real excited, we're looking forward to it," shuttle pilot Pamela Melroy radioed after wakeup this morning. The $273 million Z1 truss mounted in the back of Discovery's cargo bay houses four stabilizing gyroscopes and the station's main S-band and KU-band communications antennas. It also will serve as a temporary mounting point for a huge set of solar arrays scheduled for delivery in December. Mounting the truss atop the U.S. 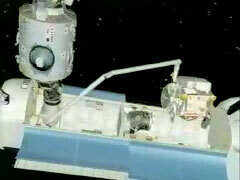 Unity module is the most complex robot arm operations yet attempted in space station assembly. 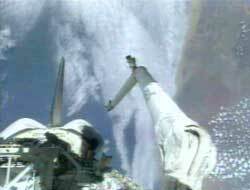 But lead flight director Chuck Shaw described Wakata as "one of our better arm operators." "It's a pleasure to have him operating the arm," Shaw said. "He's an artist with it." His crewmates jokingly refer to him as "the man." 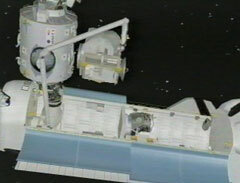 Wakata plans to mount the boxy truss assembly on the Unity module's upward-facing zenith hatch, using a Canadian-built computerized television system to precisely position the boxy component. "First thing that I will do is to turn the Z1 Truss for about 25, 30 degrees so that the seal, or the surface that will be attached to the Unity module, will be seen from the camera that is located at the end of the cargo bay," Wakata explained in a NASA interview. "After the inspection is complete, I will continue to move the Z1 to a position called a high hover position, which is over the left wing of the space shuttle. And at the point, our mission specialist Bill McArthur will operate the Space Vision System." The Canadian-built Space Vision System uses television cameras, a computer and targets on the station and components like the Z1 to determine the precise orientation and position of a component on the end of the robot arm. That data, in turn, can be used by the arm operator to precisely position a large piece of hardware for attachment to the station. It is critical for the Z1 installation "because we do not have a very good direct view through the window or from any camera views, I cannot see the connecting point of the Z1 and the Unity module very well," Wakata said. "So I have to depend on the ... Space Vision System." The Z1 truss will be attached to Unity's zenith port using a common berthing mechanism, a system of interlocking latches and bolts. Once the Space Vision System has completed its initial calculations, Wakata will position the Z1 about two feet from Unity's common berthing mechanism. "And at the point, from the camera located at the end of the cargo bay, Bill McArthur will again use the Space Vision System to calculate the vectors from the camera to the Z1," Wakata said. "Now, we have vectors from the camera to the node and also from the camera to the Z1. By using those two vectors, now the Space Vision System will calculate the relative position between the Z1 and the Unity module. That's the information that I use to operate the robotic arm." When the truss is about four inches from the Unity CBM, Melroy, operating a laptop computer on Discovery's flight deck, will send commands to activate the system's active latches. "It's a special mechanism that has four latches," Melroy said. "You put the new element that you're going to attach, you get them really close together using the robotic arm, and then these latches will reach out from the inside and grab the pieces and cinch them down. "And then we have 16 bolts that will drive to hold them together strongly enough so that it can hold pressure. "So, it's a kind of an interesting little ballet between the robotic arm operator, who has to get these two pieces close together, and the berthing mechanism operator - which, for my flight, will be me - on a laptop computer driving these latches and bolts," Melroy said. The Z1 truss is not equipped with any active heating or cooling systems and it is very sensitive to temperature. In fact,, the truss must be installed within 20 to 25 hours of docking to prevent ammonia lines from over heating. Z1 temperature constraints also pose problems for the shuttle. "We installed a canopy, or a series of blankets, over the airlock to shade our water lines that run between the orbiter and the airlock," said Bill Gerstenmaier, shuttle integration manager. "That was done because the sun angles that the station wants are incompatible with the water lines that are running to the airlock." 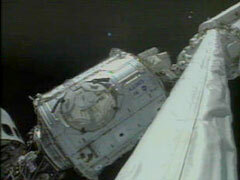 But if all goes well, Wakata and Melroy will complete the Z1 installation by 1 p.m. The astronauts then will connect electrical ground straps between Unity and the truss, reaching up into a small vestibule in the truss from inside the Unity module. Other crew members plan to enter the Russian Zarya module today to begin stowing equipment and supplies for the station's first full-time crew. The Z1 truss houses four large control moment gyroscopes that will be used to keep the station stable and to change its orientation from time to time without rocket firings that could jar sensitive microgravity experiments. The gyros cannot be turned on, however, until after the U.S. laboratory module Destiny arrives in late January. The lab module houses the computers and electrical interfaces necessary to operate the station's overall motion control system. But during ground testing, a critical Hall effect sensor that monitors how fast a gyro is spinning failed after prolonged exposure to low temperatures like those the real Z1 gyros might see over the next several months. As a result, engineers removed the heater units on the flight hardware, reset their thermostats to a higher temperature and re-installed them in the Z1 truss. In addition, laptop computer routines were written to give the station's on-board crews the ability to directly control the heaters if necessary. But at present, the station does not have enough electrical power to drive the heaters because two of the Russian command module Zvezda's eight batteries have failed. As a result, Russian flight controllers will orient the space station after Discovery departs to allow additional solar heating on the Unity module until the U.S. solar arrays are installed in December. After that, more than enough power will be available to drive the Z1 gyro heaters. But until then, the space station's first full-time crew, scheduled for launch at the end of the month, will not be able to enter Unity because of higher-than-comfortable internal temperatures. Assuming Z1 installation goes smoothly, the first of four back-to-back spacewalks will be staged Sunday to mount a new shuttle docking port, called pressurized mating adapter No. 3, to Unity's Earth-facing, or nadir, hatch. The $20 million docking port will be needed in January when the U.S. laboratory module is attached to Unity's forward port, the one currently used for shuttle dockings. "After the Z1 has been berthed and after Pam has gotten the CBMs to connect the Z1 physically to the structure, Bill McArthur and I will go out on the first EVA (spacewalk) and begin outfitting the Z1 truss," Chiao told reporters before launch. "We'll be connecting cables between the Z1 and the node and we'll also be relocating the S-band antenna as well as taking the KU dish out, attaching that to a boom and then rolling that boom out. 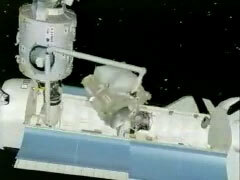 We'll also be transferring one of the tool boxes over to its location on the Z1 truss. See the Status Center for full play-by-play coverage. All times EDT (GMT -4 hours).